Miss Lola had an accident this week at the dog park while racing down a hillside at top speed. When she came to a screeching halt for no reason it wasn’t apparent at first that she’d been stabbed through her chest skin by something very sharp. When she came limping back to us we noticed the two inch tear exposing her tough muscle. I grabbed her in my arms, SB ran for the car and it was off to the emergency room for eight staples, pain killer and an Elizabethan Collar. Now she’s on two weeks rest with absolutely no running. So far she has mostly slept but I fear next week I will not have it so easy. Lola gets a good amount of running practically everyday, just to take the edge off her energy. Without the exercise she may drive me out of the house or we both may need sedation. In other news of the month, we are trying to buy a house in our neighborhood, right around the corner from where we live now. I know a month ago I had sworn off house buying for at least another year, but it is an obsession and when this house came on the market we couldn’t just walk on by. So, we have an accepted offer and the inspection is done. We are just starting the remediation phase of the negotiation. If all goes well, we will close in early June which is very pleasant time to move. I’m sure I’ll be writing more about it in the coming weeks. 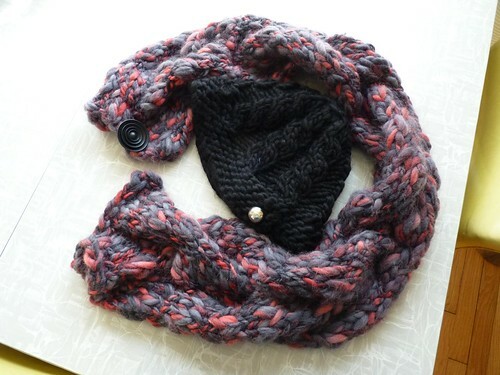 Finally, I completed my first two cable knit projects and I learned that cabling is easy and also that working with super chunky yarn makes it all go fast. I’ll have to wait until next winter to really enjoy this set.